Cats are certainly loveable pets and great companions, but there are plenty of occasions where they can be quite a nuisance. This is never truer than having a neighbour’s cat (or a stray for that matter) regularly relieve themselves in your garden, leaving you with some unpleasant mess to clean up. While it would be great if there was a universal solution to this problem, the simple fact is some cat repellent products will work for you while others will be ineffective. This is because there are various breeds of cats with varying levels of intelligence, and some will not be put off by your attempted cat repelling solution. There are other factors that can influence a cat’s reaction to cat repellent, such as their age and health, while other times it is just hard to find an explanation as to why your cat repellent isnt’ working! Below are some of the best cat repellent products available today. They vary in design and function, so some will be more effective than others, although this will all depend on your personal situation. But above all else, these are humane cat repellents that will never cause any harm to the cat -they simply act as cat scarers to ensure your garden remains undisturbed! Better still, if you feel this cat repellent isn’t working, it can be sent back within 45 days for a full refund! So, should the cat you are trying to get rid of not be scared off by this repellent, simply send it back and try something different! 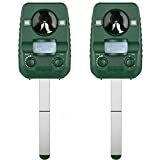 This cat repellent not only deters cats and other animals through high frequency ultrasonic sound waves, but also through flashing LED strobe lights that combine to scare off any unwanted visitors in your garden. So, if you have used a cat repellent that relied solely on high frequency sounds to deter cats, then the combination of LED lights with ultrasonic sound waves could be a great alternative. The AngLink repellent covers an area of 85 square meters with a straight-line distance of 9 metres, while also boasting a right/left angle of around 110 degrees for the infrared sensor. This provides the sensor with an impressive coverage area, which can be adjusted by changing the frequency to target specific animals such as cats. This makes it a very versatile repellent that is a great choice if you have more than just unwanted cats invading your garden, offering a safe and harm-free way to deter the animal. Another great feature for this repellent is the fact it is solar powered. The batteries are included and will be recharged during the day, making for a convenient and eco-friendly cat scarer. For those cloudier days where there is little charge provided, you can easily take the sensor inside and charge it manually using the micro USB charger included with the product. As you would hope, it is completely waterproof so can remain outdoors for as long as needed and as it is very compact in design, you can place in almost any area of your garden without standing out. Are light and/or sound repellents not doing the trick? Then this jet spray cat scarer from PetsBye may do the trick. Let’s face it, most cats detest being sprayed with water, making the concept behind this repellent very noteworthy. Whenever a cat or other small animal such as squirrel pass in front of the motion sensor of the repellent, a spray of water is automatically fired towards their direction for five seconds to scare them away. This does mean you will need to connect it to a garden hose to provide a water supply, but it’s safe to leave the hose on as the repellent only fires water when the motion sensor is triggered. You may want to invest in a repellent such as this because products that rely on ultrasonic soundwaves to deter cats can inadvertently effect smaller pets such as rabbits or guinea pigs. The sprayer device ensures no animal is distressed from the repellent, so it’s worth considering this should you own small pets. With a range of 10m in a 120-degree arc, the repellent can be placed throughout the garden, with a total coverage area of around 100 square metres, allowing you to set it towards any problematic spots where the cats enter. The spray works automatically as soon as the motion sensor is set off, and it will simply rest itself after each activation. It is battery operated however, so will need four AA batteries to work. Battery life depends on how often the repellent is activated, with an expectancy of around 3-4 months based on 10 daily activations. Attach to a hose, set the sprinkler arc range and then the repellent is good to go! Sometimes you cannot go wrong with a simple cat repellent, and there are fewer products that are simpler and more affordable than fence wall spikes. These are not just an effective repellent for any cats that enter your garden from atop fences or walls, but also any would-be human intruders. While their design may make them appear to be harmful, cats are not harmed in any way when they come into contact with fence wall spikes such as these; they merely cause discomfort that deters them from using a wall or fence. In fact, cats of a certain breed or age will have a high tolerance to spikes such as these so are able to walk across them without much fuss. The issue is when they have to jump onto spikes, as cats hate to jump onto uncomfortable surfaces such as these. Therefore, the spikes should always be installed on fences that are at least 6ft, otherwise they could end up ineffective. As a result, you will want to move any objects near a fence or wall that a cat can use to climb for the spikes to be their most effective. This ten pack of spikes offers enough product to cover large fence areas, which is vital as this type of repellent works best when there are no gaps or spots on the fence that the cat may be able to navigate through. They also come with warning signs so that it is clear to anyone that there are spikes on your fence or wall. This is necessary to meet current laws regarding fence spikes, so everything you need to ensure your setup is safe and legal is included with the purchase. Now, there is a chance you may see a cat walking over them or at least attempting to do so. This is fine as many cats will initially test the repellent before leaving it alone permanently. A great product and certainly a worthwhile cat repellent for anyone on a tight budget! In a life where stress is rife and it can be hard to relax, cats and dogs prove loyal companions and they try their hardest to make us happy (normally they succeed). However, many animals, especially cats belonging to others, can wreak havoc in our gardens. Today, we’re going to investigate the biggest problems caused by cats as well as potential solutions you can utilise to make the problem go away! ‘They’re scaring my own cat’ - Firstly, other cats coming into the garden can make our own cats a little wary. For those without a strong presence and unable to scare off unwanted visitors, they can start to become scared of their own garden and this is never good news. ‘They’re trampling my flowers’ - Often, people question why they should bother going to the effort of planting beautiful flowers when a cat keeps coming in and walking all over them. Unfortunately, this is a common issue and people eventually give up on their outdoor space because they never reap the rewards. ‘They’re using my garden as a toilet’ - Another reason why flowers aren't successful is because cats can treat the garden and soil as a toilet. While trying to relax with family and soak up the sun, there’s nothing worse than smelling the work of next door’s cat. ‘They’re scaring the birds’ - Finally, avid birdwatchers will know the frustration of watching a stunning species fly away thanks to a neighbour’s cat stalking it on the fence. Other problems? - Even after the four issues mentioned above, you might be getting annoyed at your salad plants getting contaminated or even your fish getting attacked in your garden pond. If you’re struggling with any of these issues, keep reading because we may have some useful solutions to try. Although there are specific products you can put into your soil to prevent cats from going to the toilet and stepping all over your plants, like cat repellent, a solution to prevent cats from coming into your garden completely seems to be the most efficient for most. So how do you do this? First and foremost, we would recommend checking your garden for holes and gaps in the fences. Of course, cats are extremely agile and great climbers but you’ll be surprised by the number that enter through a simple hole in the fence. While on the note of boundaries, wire or string around 10cm above the top of fences can make it difficult for cats to balance and they’ll soon give up trying. Finally, you could even try cat-resistant plants including the curry plant or the citrus-scented lemon balm; this is a less scientific solution but one that many swear by. If you’re willing to spend a little more on finding a solution, many choose to install ultrasonic devices which emit a high-pitched sound; while most products these days are safe, be sure to do a little research and choose a product with positive reviews. Similar solutions that can remove the comfort cats feel in your garden include motion-activated sprinklers, unused CDs (for a shining light), and even water bottles. For the most part, these solutions should deal with the issue. If this isn't the case, a number of gardeners are choosing to mulch soil with manure or another material that retains moisture since cats won’t enjoy the wet feeling under their paws. In terms of a pond, a simple piece of netting should protect your fish without detracting too much from the scenery. In truth, many find success with some of the cheapest solutions we’ve provided, including cat repellent in the soil, so don’t feel as though you need to invest heavily to keep cats away; always try the simple and cheap solutions first. Once the problem is alleviated, you can enjoy your birds again or allow your own cat to roam freely! We have also written guides on deterring foxes from the garden and reviewed the top mole traps to consider if you have issues with them. Above are what we believe to be some of the best cat scarers and repellents currently for sale on the market.